On June 2nd of this year, Canada's Truth and Reconciliation Commission achieved a historic milestone: after six years of gathering testimony from 7, 000 witnesses, the Commission released a summary from its final report into the history and legacy of the Indian Residential School system in Canada. The numbers are striking. Over 100 years, 139 residential schools operated across Canada. Before the the last school was finally shut down in 1996, 150, 000 First Nation, Métis, and Inuit students had been made to attend these institutions, leaving an estimated 80, 000 Survivors and 6, 000 dead children. More arresting, however, are the statements made by survivors, in their own words. Although the full report will not be made available until later in the year, the summary includes 94 recommendations which call on the various levels of government, public servants, teachers, and other Canadians to acknowledge the direct harm done by the Indian Residential School system to First Nation, Métis, and Inuit children and their families. More broadly, the Commission has drawn up the terms by which the relationship among our various peoples can and must go forward. To better understand the experiences of residential school Survivors and to learn more about what you can do to engage in this process of reconciliation, have a look at these books from Halifax Public Libraries' own collection. 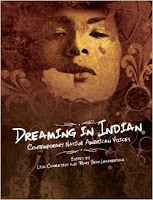 Dreaming in Indian: contemporary Native American voices, edited by Lisa Charleyboy and Mary Beth Leatherdale.